Sanctuary on 8th gets fresh look, funds from local marina - The Resident Community News Group, Inc. | The Resident Community News Group, Inc.
Marina staff and boaters from The Marina at Ortega Landing donated material, labor and a check for $500 to The Sanctuary on 8th Street. 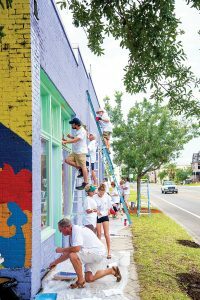 When IGY Marinas – the management company for the Lakeside-based Marina at Ortega Landing – sought a local nonprofit for its worldwide service day project, one of its boating clients recommended The Sanctuary on 8th Street. Leslie Jones, a longtime San Marco resident and realtor, was on the founding board of the Springfield-based nonprofit, which provides afterschool, summer school and homeschool programs. A slip holder at the marina for her 42-foot catamaran, Now & Zen, which offers sailing charters on the St. Johns River, Jones suggested the Sanctuary to Cam Melangton, the marina’s general manager. 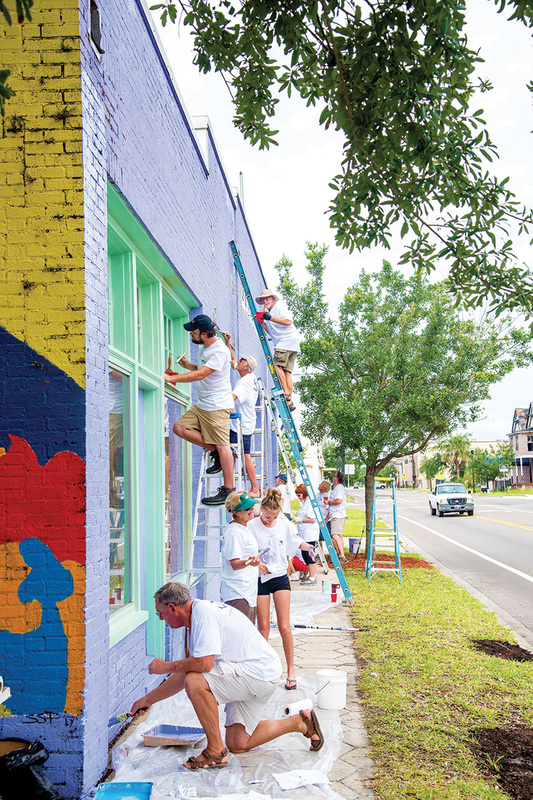 Once a post office, The Sanctuary’s 88-year-old building needed a good sprucing up on the exterior, so Melangton and 14 others – including five staff and nine volunteers from the marina’s boating community – power washed the building and sidewalk, repainted the front of the building in lavender and green, and installed tropical-themed stained-glass vinyl graphics on boarded-up windows. Fresh mulch was also placed around trees at the “Giving Day” event. In addition to nearly 100 manhours in volunteer labor, the Marina at Ortega Landing donated nearly $3,000 in paint, mulch and window graphics, plus a check for $500 to fund summer school supplies at The Sanctuary.